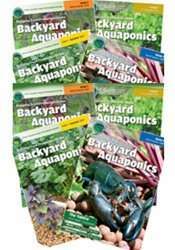 I’ve ordered all 13 issues of Backyard Aquaponics Magazine. It’s a pretty good magazine and will give you lots of great ideas for your aquaponics journey. The first issue is free. You can download it now if you’d like. It’s a steak at under $70.00. This entry was posted on Wednesday, January 9th, 2013 at 12:37 PM	and is filed under Hydroponics / Aquaponics. Both comments and pings are currently closed.